Mysteries of the psychic world revealed -- how information is obtained, what predictions can be trusted -- even learn how to be your own psychic. Truthful, enjoyable and easy to read, you will delight in this experienced insider’s view of life as an accurate psychic. 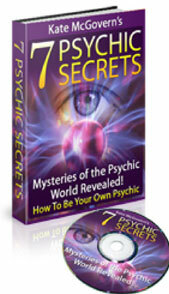 7 Psychic Secrets — Mysteries of the Psychic World Revealed! The woman was totally amazed when she was told by a psychic that she had breast cancer. It was shocking because she took such good care of her health and had no symptoms. But the psychic was almost certain that because of the unloving relationship the woman was enduring, that the heartache had manifested in her chest. Does it frustrate you that this type of scary news could be given to someone without any basis in the truth, and that the same psychic could go from one person to the next spreading fear and confusion? Well, it certainly frustrates me! I was the one receiving the reading. I had won a psychic reading at my local church, and I was so excited to actually be on the receiving end of getting a reading because I am a psychic and healer myself. I want to share with you what I did next. I waited until I got over the shocking news. It took me about a month-no kidding! Then I went in for testing and found out that there was no basis in fact for the opinion of that irresponsible psychic reader. Please, Get a Great Psychic. Look, it's your life and you are doing your best to steer it in the right direction, and every once in a while it is great to get support, understanding and clarity for your life from a skilled psychic reader. After reading this book, you can feel confident about your selection process of who you want to influence your life and decisions. Have you ever wondered how honest, accurate psychics get their information? Or perhaps you may want to know if the psychic will be able to read your secrets! When you get a better understanding of how the psychic world operates, you will feel and be able to judge what goes into a really great psychic reading. I really know how important it is that you get the very best advice possible each and every time you allow someone to read for you. You are the one who wants answers to your questions and you deserve to have the best. With more education and understanding on your part, you will have the ability to know how to select the perfect person for your needs. This book guarantees to fill you in on knowing where the information in a reading comes from. Once you know that, you will feel reassured about who to choose to read for you. Next, you will know what to request and what to seek in a reading. With that knowledge, you will prepare yourself for the best reading possible. If you have wondered if a reading can change you or if a psychic reader can know your secrets, this book guarantees you will come away informed and ready to know the truth. Get informed about the accuracy of predictions for your future and whether or not a reading can help heal your body. The truth will set you free! Finally, we know that after reading this book, you will understand more about being intuitive so that you can know answers for your questions yourself.